Passover (Heb. 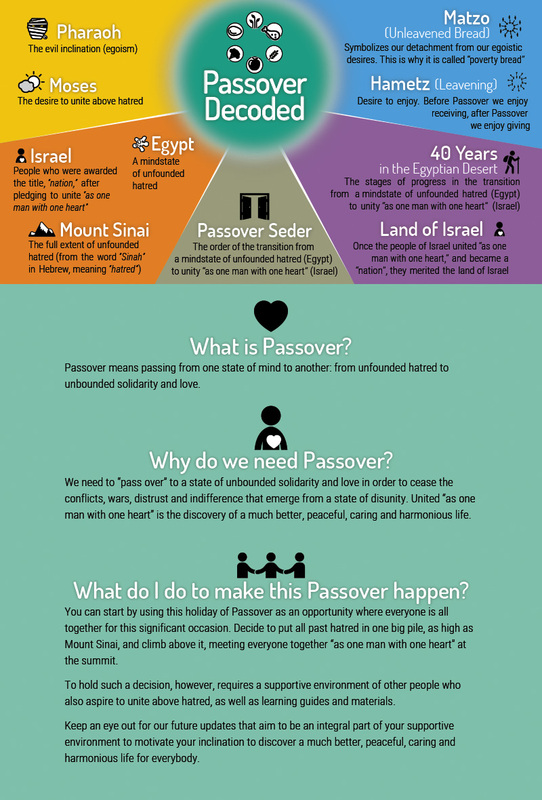 “Pesach“), which commences on the 15th of Nisan each year, is a holiday that marks the unity and mutual understanding that the Jewish people reached in their exodus from Egypt. As with all Jewish holidays, the spiritual meaning of Passover is of much greater importance than its history, as it marks a process that takes place in our attitudes and relations. Its relevant to any person who wishes to work on developing their innermost desire, regardless of background, race or nationality. Passover ultimately signifies a transition in our attitudes and relationships: from egoistic, divisive relations to altruistic, connected ones. Passover signifies a transition from exiting the feeling and control of our egoistic, divisive world, and entering the feeling and control of the higher, altruistic, united world. The key to making this transition is to have a desire for it. That is, it is a holiday that relates to the inner process that any person who works on developing their desire to unite, love and connect with others atop their innate egoistic urges can undergo. The transition is marked by the exodus from Egypt. Egypt signifies our egoistic desires. The time in Egypt of the people of Israel (i.e. people who have a desire for spirituality, “Israel” from “Yashar Kel” [“straight to God”]) signifies a stage of growing egoistic desires that disallow the people of Israel’s unity. Pharaoh marks the rule of the ego. Pharaoh is ready and willing to supply for every egoistic fulfillment we could wish for. However, Moses, which marks the desire for connection above the ego, fuels the people of Israel’s desire to discover the Creator, i.e. the quality of love and bestowal, in their unity. When we see that we are unable to unite, we feel that we are in the darkness of Egypt. In that state, we become ready to do anything at all just to break free from the egoistic desire’s rule. That state is considered as the escape from Egypt. In relation to a person on the spiritual path, it describes a stage where a person becomes ready to do anything just to break free from the ego, to rise above it and reach the Creator’s quality, i.e. love and bestowal. We throw ourselves into the sea, which parts, and we cross it, i.e. we cut ourselves off from the ego, and by doing so, by being above the ego, we become ready to work with it and transform it into altruism. This is the exit from Egypt we celebrate during Passover. Passover is much more than a historic tale. Let’s look at this holiday through the eyes of the wisdom of Kabbalah. In the Haggadah, the land of Egypt represents a relationship of separation. A sort of living in a pool of ego, exploitation and despair, a state where everyone takes care of their own interests leaving the others to eat bupkis. Israel represents the opposite situation. Life is full of joy, love of others, mutual guarantee… hang on a second, who are we kidding? Even if some of us physically live in the land of Israel, we’re still in that inner state of Egypt. To be in Egypt means to be ruled by Pharaoh, the representative of the ego culture. He loves to turn us against each other, separate us, divide and conquer us, and eat Hummus every morning even though it’s bad for his digestion. Moses, in contrast, is the representative of unity who doesn’t stand a chance if he goes head to head with Pharaoh, unless he’s got the entire people of Israel united around him. And now we are ready for… the Exodus. The burning bush, staff and snake, blood, fire, charoses, and a mighty arm… all it’s really talking about is our choice between a reality of hatred and separation vs. a path of hope and connection. Because that is how it always worked—either Pharaoh is ruling over you or you lend a hand to Moses. And it’s true even now. Let’s take our government system for example: public representatives and political parties allow the Pharaoh to party without restraint. Everyone is at each others necks, fighting, insulting, back stabbing… this is exactly the state called Egypt. But if we decided to look for unity above everything, we will awaken Moses and see that it is possible. This is the meaning of coming out of Egypt towards Israel, toward connection and inclusion of everyone, above all the rifts and differences. Let’s face it; it’s not going to be simple. We have to learn how to bite the bullet, swallow a few frogs, overcome ourselves, and make some concessions, like a family. Because this is what we really are, what we’ve always been. One big extraordinary family. And the nice thing is that once we begin to think this way, we’ll begin to feel this way. Because to be truly free means to be together as one. Man contains all forces and qualities of nature: Pharaoh, Moses, nation of Israel, nations of the world – all these qualities together. A person is a small world that includes everything. We only have to connect and balance these components. In the beginning of the spiritual path, we think that we can correct ourselves. At a certain stage, after many attempts and failures, we find it impossible to correct ourselves, that only the upper force can correct us. Our repeated unsuccessful efforts in correcting ourselves teach us to lower our head and request what we do not actually want: love, bestowal and connection—an opposite nature to our current one. We then receive help and transform into our opposite by starting to enjoy what we previously hated. We have to go through this whole process mentally and emotionally with understanding, awareness and agreement. Everything we were once proud of, which we considered respectable, now seems the opposite. We discover our lowliness and helplessness. Our desire to receive, which knows only how to fill itself, feels helpless when it learns about a totally new method. This process takes place according to the three symbols: Pesach (Passover), Matzah (unleavened bread) and Maror (bitter herb). It is called “Pesach” from the Hebrew root “Pasach,” i.e. to leap, as we constantly leap from one side to its opposite, inverting our small amounts of receiving into bestowal. We do that by Matzah, “unleavened bread,” also called “the bread of affliction,” since we have no other food and we agree to settle for what we receive from bestowal. At this stage, we constantly elevate the importance of bestowal, symbolized by Matzah, over our desire to receive, which we feel as bitter, symbolized by Maror. This is considered overcoming, in which we are considered as heroes (the words “overcoming” [“Hitgabrut”] and “hero” [“Gibor”] share the same Hebrew linguistic root). We then reach Pesach (Passover), a transformation of our consciousness. This upgraded attitude above and toward the unchanging desire to receive builds the human (Adam) in us. Adam, from the term “Domeh le Elyon” (“similar to the upper one”) is the system that starts operating according to the new principle with the same natural attributes, but by using them in order to bestow. After descents a Kabbalist returns to awareness & perception, experiencing new inspiration. Then it repeats, in hardening of the ego/pharaoh’s heart. Thru such “exits” he attains the Torah- the process of revealing the Creator, and achieves adhesion with the Creator. The spiritual path is pleasant, attractive and inviting in the beginning. It promises to lift us to all kinds of attainments and revelations. Afterward, when we start understanding what we need to give in order to spiritually complement ourselves, the period then becomes increasingly difficult, unattractive, repulsive and confusing. That is the period of Maror (bitter herb). How can we endure that period? In the darkness, through many dangerous alleyways and connections, we need to remain locked on the spiritual goal, as if we’re seeking a small coin in a vast, dark field. The problem in this period is that we need to sharpen our senses, reach a new dimension and attain a new sense. It is a tough state. It requires constant encouragement in raising the importance of the spiritual goal, love, bestowal and connection, all the while egoistic goals constantly itch at us, demanding attention. It is a period when many people leave the spiritual path, and the only advice to get through it is to increase the importance of the spiritual goal upon the darkness and unpleasantness. Then it is considered that only the heroes (heroes [Heb. Giborim] as those who overcome [Heb. Mitgabrim] the ego), emerge from that period, out of not having any other choice, and also out of a mutual guarantee to supply each other with confidence and support in the attainment of the spiritual goal. Those who properly establish themselves to develop a new inner system of work in bestowal, detached from themselves, the egoistic system, reach what is considered as the path of exiting the exile to the land of Israel. Maror is egoistic pleasure. To our ego, Maror is sweetness, delicacies and delights. However, when we want spirituality, we discover these sweet things as bitter. We discover that we want to reach bestowal, but we cannot. That is, the quality of reception becomes bitter. Therefore, our main work in Egypt is in chewing Maror. It is the feeling of being unable to exit Egypt. It is the constant effort to hold a desire and request for the spiritual goal. If we remain locked on the spiritual goal in this state, our spiritual desire emerges into becoming a true need for help from the higher power to grant us its nature of love, bestowal and connection. 7 hungry years: we discover the bitterness of working inside the ego although it gives us sweetness; but wanting to achieve the quality of bestowal, we feel bitterness, maror, for we can’t bestow. We can’t turn bitterness into good so that bestowal starts to feel sweet. Maror, bitter greens eaten at the Passover meal, symbolize difficult labor in egoism’s/Pharaoh’s slavery. One must chew slowly to feel the bitterness of the difficult, lengthy attempts to break free from egoism to escape! Hametz symbolizes the connection between flour and water. Flour symbolizes the quality of the egoistic desire. Water symbolizes the quality of the altruistic desire. On Passover, we are in the final stage of the ego’s control. We start feeling the ego completely controlling us, since we lack the quality of the water (Hesed [mercy]), which is what the Matzah symbolizes. Matzah is the connection between flour and water. They are mixed for a very precise period of time—18 minutes—so that the flour will not start rising. If they are mixed too long, then the dough has to be kneaded constantly without stopping. This process symbolizes our work with the ego, where we have to keep working with it, giving it new forms over and over again, each time shifting it to altruism. In principle, it is impossible to work with the Hametz for over 18 minutes, which means that the connection has to be minimal, just as it appears in our egoism. What is altruism? That we want to show good intentions toward someone so the ego will benefit from it? The Matzah symbolizes the lack of water (Hassadim, Hesed [mercy]) in our egoistic attitude, and so it is denoted the “bread of poverty,” which means the poverty of a wide heart, in the openness among people. It is customary to eat Matzah on Passover eve because on this night we discover the extent to which we have no ability to unite with each other, no ability to have relations of love and bestowal among us. We become ready for anything as long as we can exit this egoistic state, and so we eat Matzah on the night of our liberation from the ego’s control. Hametz (leavened bread) signifies our negative, egoistic attitude to others, where we look at others as a means to fulfill ourselves. Burning Hametz means removing this negative, egoistic attitude from the world so that it no longer remains in our lives. We are able to reach this decision with mutual support, as it is written, “each shall help his friend.” Then, we reach a state where we burn our egoistic connections, leaving nothing behind us. We stand before the entrance to the new world and cross the Red Sea. Crossing the Red Sea means crossing the barrier from hatred to love for others. It is not love yet, but the beginning of a good attitude toward others. Only after exiting egoism (Egypt), a person can do the Creator’s Commandments & say “in memory of the exit from Egypt.” Because all Commandments are the correction of actions intended for self gratification to the intention for the sake of the Creator. Passover is about salvation from the exile in Egypt. It describes the period of enslavement to our egoistic desires, the growing feeling of bitterness we develop in that state, and the eventual exit from it after reaching an unbearable sensation that we have no strength to exit our egoistic desires, yet we feel the absolute necessity to do so. When we feel the full extent of these two opposite poles of sensation, the waters of the Red Sea (in Hebrew, it is called “the Final Sea” [“Yam Suf”]) open up, and we cross it. We do not know how it becomes revealed. It is considered as a miracle, but one that we cause after we reach a stage of helplessness. We fail to understand how it is possible to exit the egoistic control of our desires, since we find no strength to do so by ourselves. We also fail to understand that there can be a higher power that can somehow change our nature. However, this higher power becomes revealed. This is why the exit from Egypt, i.e. the exit from the control of our egoistic desires, is considered as a miracle. It is an act performed on us from the upper force, above our egoistic nature, in response to the need we prepare for that exit on our behalf.